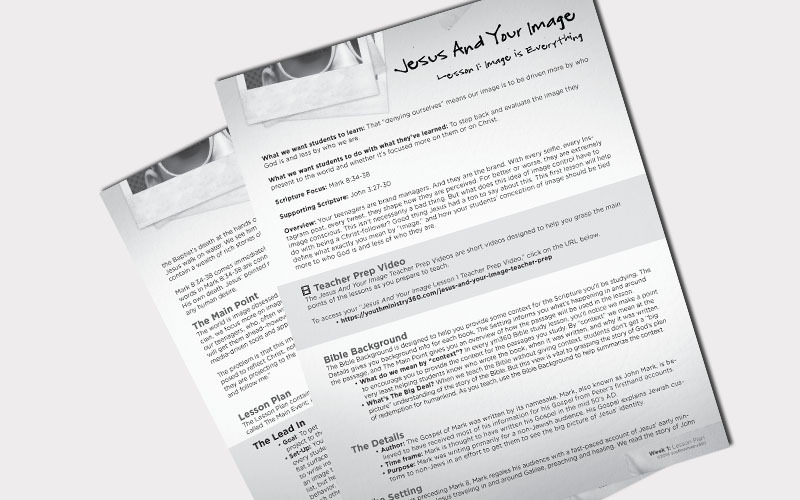 Try an entire lesson from our Jesus and Your Image Bible study for free! 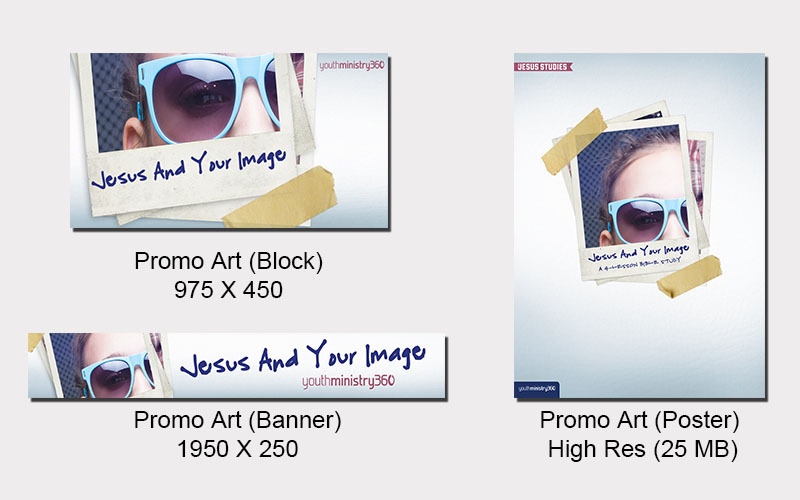 Here at YM360, we love giving away resources that will encourage and support you. It flows from our desire to equip and serve youth workers relationally. Thanks for the opportunity! 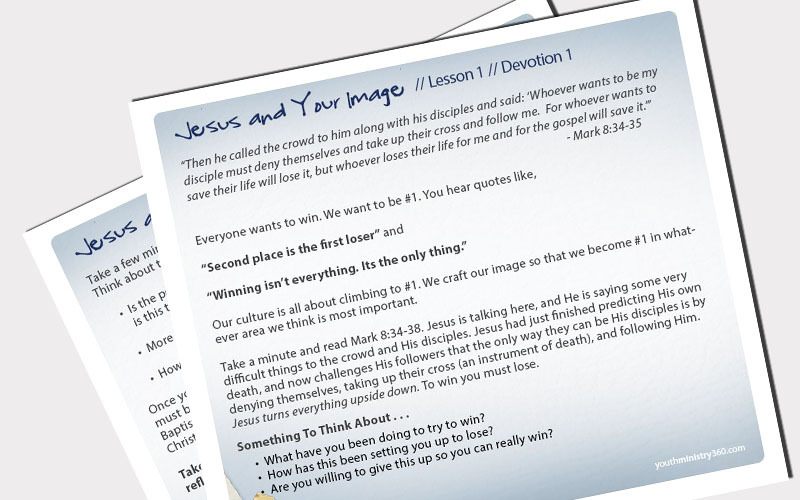 What You Get: 1 free lesson of Jesus and Your Image four-lesson Bible study. Today’s teenagers are brand managers and they are the brand. With every selfie, every Instagram post, every tweet, they shape how they are perceived. For better or worse, they are extremely image conscious. This isn’t necessarily a bad thing. But what does this idea of image control have to do with being a Christ-follower? Good thing Jesus had a ton to say about this. 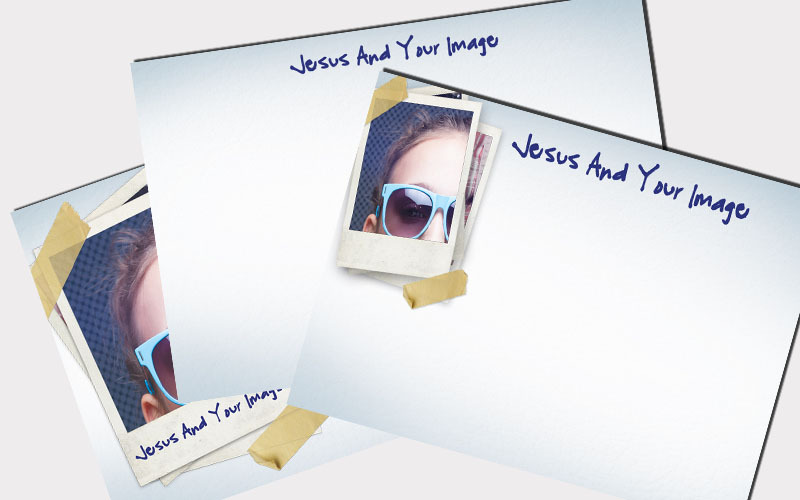 Teach Jesus and Your Image to your students and help them promote a Christ-centered image to the world. Objective: This first lesson will help define what exactly you mean by “image,” and how your students’ conception of image should be tied more to who God is and less of who they are. Objective: Few teenagers project an image that makes much room for the struggles, the pain, and the brokenness so many of them suffer with. Yet, God welcomes their brokenness. This lesson will help you challenge students to give their hurt to God, not worrying about their image, and trusting Him to heal their pain. 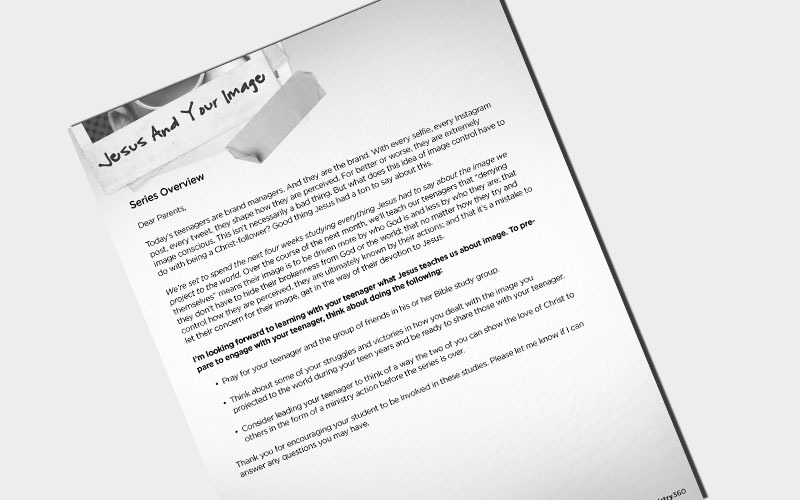 Objective: As your students are challenged to project an image that is more about Christ than about them, it’s vital that their daily actions reflect this. In this lesson, you’ll get the chance to help students grasp this truth. Objective: This final lesson will help your students see what it looks like for someone to put serving God above what others think about her. 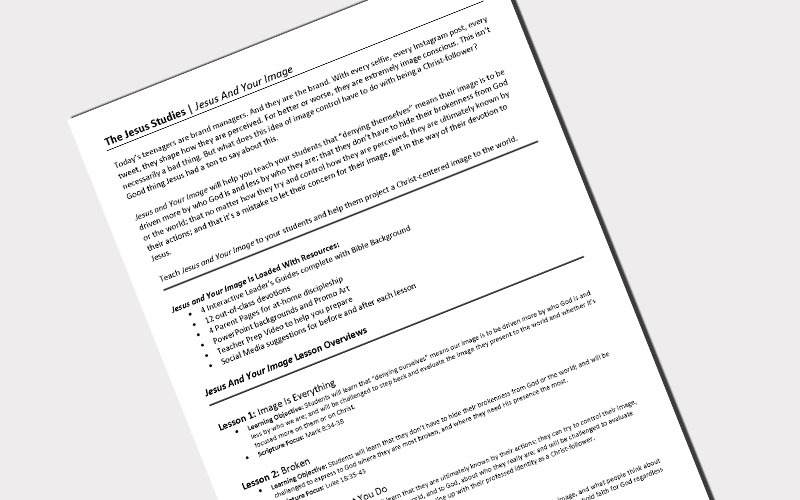 In this lesson, your students will be challenged to forget about what people may think about them and to pursue Christ above all else. A 10% Discount on the entire Jesus and Your Image Bible study just for you! 1 Features Overview Page for previewing all study components. 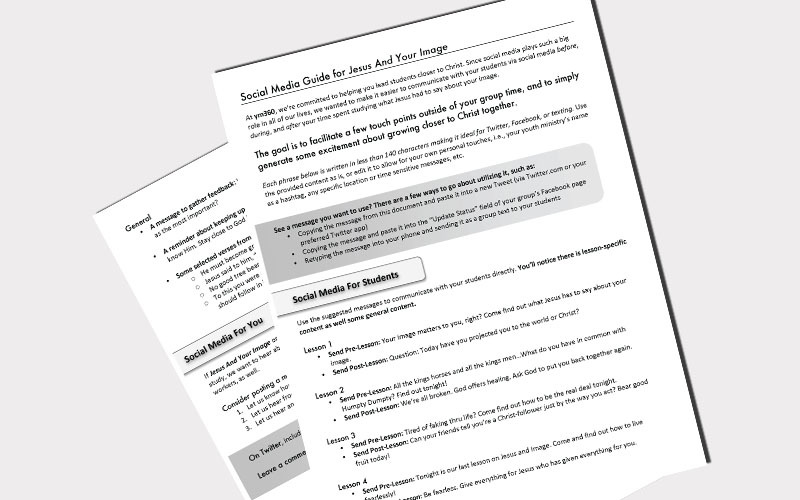 These include Weekly Student Devotions, Parent Pages, PowerPoint backgrounds, Promotional Artwork, and Social Media Suggestions. The Bible Studies you use in your youth ministry will help your teenagers grow deeper in their faith week in and week out. From new believers to students who are boldly owning their faith, the study of God's Word is vital in your youth ministry. Since 2010, youth leaders just like you have trusted YM360 Bible Studies to help empower discipleship in their ministries. Our Bible studies are Bible-based, easy to teach for your volunteers, Gospel-centered, and relevant to students. Click here and pick out a time to speak with Amy about how we can help you find the perfect Bible study fit for your ministry goals!